From the street, it might take visitors to Yves Béhar and Sabrina Buell’s San Francisco home a moment to find the front door. A seemingly unbroken stretch of black anodised aluminium – which looks flat from afar, but up close exposes a unique CNC-machined pattern of nicks and notches – spans the ground-level facade, disguising both a garage and the aforementioned entrance. Each fits flush within the mottled expanse; a pair of portals, hiding in plain sight. 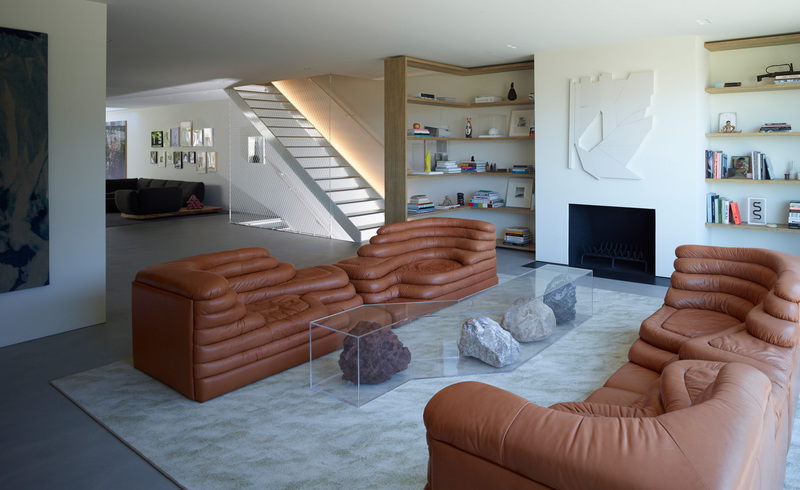 This interplay between raw materials and careful craftsmanship, the clearly visible and the cleverly, strategically obscured, is one that is repeated throughout their three-level home in San Francisco – itself a domestic dream-turned-reality that has been, in many ways, decades in the making. Béhar – a de facto design superstar who established himself with tech-forward projects like One Laptop Per Child, Jambox and Sodastream – and Buell, one half of the art advisory firm Zlot Buell, which caters to the Bay Area elite, bought the property in 2008 for themselves and their three children (they’ve since also introduced a newborn into the fold). For nearly three years, they lived in the ‘nondescript cottage with a 1990s-era Italianate renovation’, as Béhar diplomatically describes it, before gutting the space and embarking on a complete overhaul. ‘It was a renovation that felt like a ground-up construction, which was really, really difficult,’ he remembers with a laugh. ‘I would not do it that way again.’ Yet even this direct acknowledgement isn’t a regret. Béhar believes in experimentation as an integral part of the creative process, one that is informed by potential missteps in addition to perceived successes. Not one square inch of the interior was left without Béhar’s figurative fingerprints. He designed the house’s masterplan and layout himself, with floor-to-ceiling windows throughout and a sense of social and visual flow in mind. The open-plan living room, kitchen and dining room is where most time is spent – bustling during breakfast, when everyone’s getting ready for the day, and mellow in the evening, when Béhar and Buell play board games with the kids before bedtime. It leads to a backyard terraced with angular concrete levels and landscaped with greenery native to northern California. And then, above everything, is the cantilevered, minimal-to-the-max master bedroom and en suite, with a comprehensive view over the play space and yard to the back, and out to Alcatraz on the other side. Behind a bare white wall is a split bath featuring a Japanese soaking tub. Anyone washing who wishes to talk to someone on the other side can simply push open a peekaboo panel and say hello, face to face. A large part of Béhar’s ‘thing’ is technology. He is fascinated by the minor and major ways in which it can make our collective day-to-days easier, more efficient and, by extension, more enjoyable. Electronic touches are ubiquitous but unobtrusive. The front door unlocks automatically when Béhar or Buell approaches, thanks to the (Béhar-designed) August smartlock system. With a quick tap of an iPhone, a flat-screen TV emerges from a downstairs console that doubles as storage for spare tableware. A trap door separates the master bedroom from the bustle of the rest of the house, and can be operated with the touch of a toe on a button situated at ankle-level. ‘A big part of the magic is the reveal,’ he says. While Luddites would still be comfortable – he didn’t eschew things like traditional light switches – there are always a few communal iPads out, should anyone invited over want to assume control. And yet the tech is not all purely functional. There are cheeky flashes too, like the line of all-but-hidden LEDs that runs along the ceiling in the master bedroom and changes colour with a few swipes on a smartphone. ‘It’s like my secret disco ball,’ Béhar says of the installation, which recalls Leo Villareal’s Bay Lights by way of Saturday Night Fever. For Béhar, his home is less a culmination so much as a continuation of all that’s come before, and an indicator of what’s still to come. There, cutting a sleek silhouette on a tree-lined hill, stands a home that is – like the city that surrounds it, and the family that lives within – forever evolving.